Being home (almost) every day during the summer is hard when you’re used to constantly being on the go. So today I decided to do some home baking. 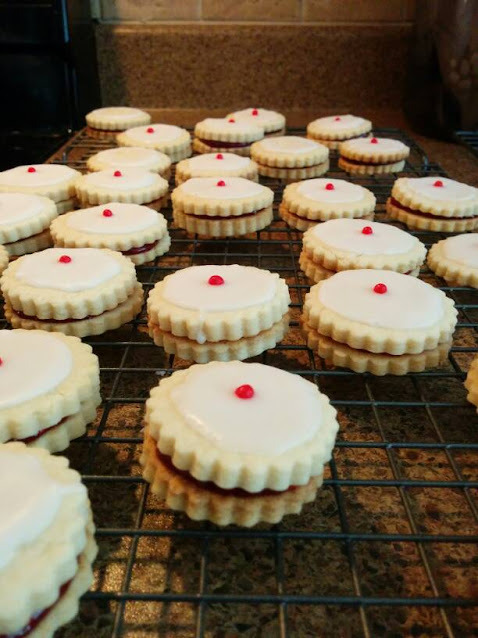 Empire cookies have always been one of my favourites, so I thought that today would be a perfect day to make my own (for the first time, bear with me!). They’re a classic British favourite, and as I am (greatly) missing the UK, I thought I would indulge myself. I looked through some great recipes online, but I ended up using hiddenponies‘ recipe. My cute little empire cookies! I topped most of mine using cherry red dragees, but I sprinkled some toasted almond on others. In mixer with paddle attachment, beat butter and sugar until fluffy. Then, beat in the egg and almond extract. Add half the flour and baking powder; stir. Add the remaining dry ingredients and mix until you get a smooth dough. Dough will be slightly stiff. On a floured surface, roll dough to ⅛” thickness. Using a 1.5” round cookie cutter (with scalloped edges, if available) cut out shapes. Rework the dough as little as possible. Cookies can be placed very close together on baking sheet, as they do not expand when baking. Bake cookies for approximately 10 minutes, or until slightly stiff. Cool completely on wire racks before frosting. Combine water, icing sugar and almond extract in small bowl. Pipe a circle on the top of half of the cookies using the relatively thick frosting. Once complete, add more water to the mixture to loosen. Using a tapered spatula, spread thinned frosting inside circle. Decorate as desired. 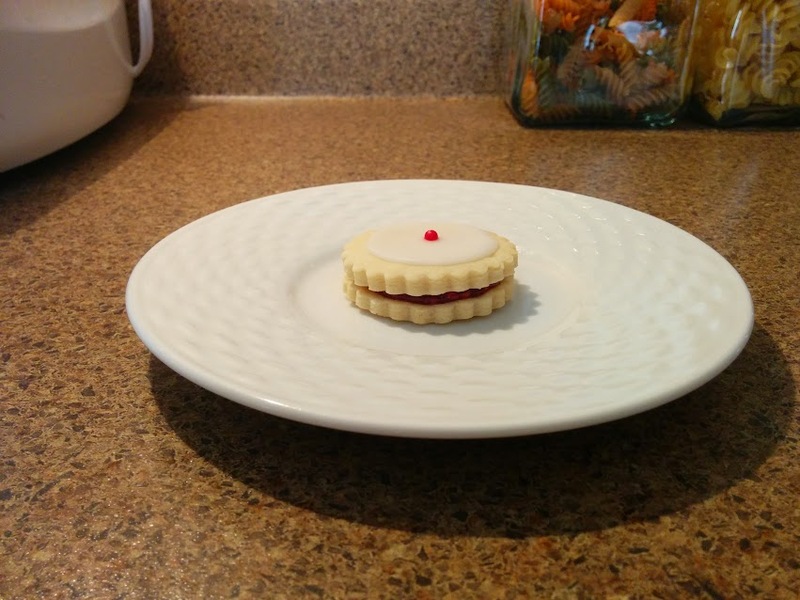 Spread ½ tsp raspberry jam onto the bottoms of your unfrosted cookies. Match up with frosted tops and create little sandwiches. Allow for 3 hours to set before packing. Variations: use vanilla or coconut extract instead of almond; top with red dragees, toasted sliced almonds, granulated sugar, candied cherry, etc.